Happy Wednesday everyone! I’m excited to be participating in the 12 Days of Christmas here on The Crumpet. Mostly. “Sure, I’ll do a guest post!” I said. 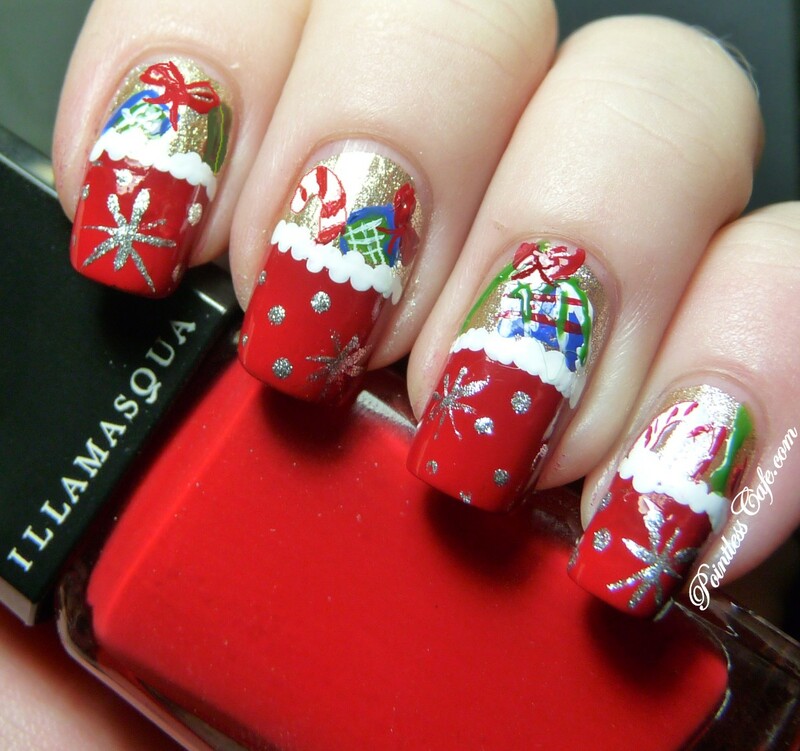 “Christmas manicure? No problem,” I said. I always seem to open my mouth and overload my “talent quotient.” BUT, it’s The Crumpet! So I’m not great at nail art. You guys will be kind I hope. ♥ Thanks so much, Debbie, for having me! I decided to do Christmas stockings because when I was a kid, we never had a fireplace or mantle and I always wanted to have my own Christmas stocking to hang for Santa to fill with little goodies. I used Borghese Lira for the sparkly gold background, Illamasqua Throb for the red stocking, Pure Ice Silver Mercedes for the silver stars on the stockings and Pure Ice Superstar for the white. I’m not really sure what I used for the prezzies inside the stockings...a little of this and a little of that. Thanks Sheila. "Not good at nail art" .... mutter mutter ... yeah right .... Even *I* can't do this ! !